Most people with diabetes wish for a day without the disease. Likely, most would agree that diabetes is both a hassle and a burden. Some opt to take temporary vacations from the disease—and unfortunately, some make those vacations permanent. Our job as RDs is to help steer our patients down the path to diabetes control and aid them in staying there. This is a very difficult job, one that demands practice, empathy, patience, and creativity. We are nutrition experts, but we should provide our expertise only in small doses for optimal patient satisfaction and outcomes. There are many barriers to optimal control that a patient with diabetes may face. These barriers may be cognitive, emotional, social, financial, and/or geographical. For instance, patients may suspect that treatments are ineffective or may lack the self-efficacy, family or social support, time, money, or local facilities (eg, parks, grocery stores with fresh produce) to reach their goals. It is important to discuss potential barriers with patients and together arrive at a plan that addresses obstacles. 10. feeling that doctors don’t understand diabetes enough. As RDs, it is important to remember how stressful and cumbersome diabetes is to our patients. Less than 50% of patients comply with recommended lifestyle changes.1 A top-down, advice-giving approach is usually inadequately motivating and does not result in successful behavior and lifestyle change.2 Simply telling a patient what to do is often highly ineffective and will likely result in frustration for both the patient and the healthcare provider. Dictating instructions for lifestyle change could cause the patient to feel challenged to assert control by continuing the unhealthy behaviors in protest. While it may be tempting to unload all of your knowledge about diabetes and nutrition in a single session, stop and ask the patient how he or she may best be assisted. Start at the beginning: “Do you know what it means to have diabetes? How does it make you feel? What do you find most frustrating? What can you do to change that?” It is imperative that we not only provide our patients with information but also teach them how to apply that information to their life. We need to realize that changes don’t occur overnight just because we say so. Thus, we need to become more client centered in our counseling. There are many ways in which a diabetes-focused nutrition counseling session can become more client centered. Using motivational interviewing (MI) is one way. Professionals have used MI for many years to help those with addictions to drugs or alcohol, and the technique has gained more popularity within the healthcare field during the past decade. Numerous studies have demonstrated MI’s effectiveness in weight management and diabetes. A recent randomized, controlled trial by Channon et al found that MI was an effective method of facilitating behavior change in teenagers aged 14 to 17 with type 1 diabetes and that it ultimately improved their glycemic control. Similarly, West et al found that MI served as a beneficial adjunct to behavioral obesity treatment for women with type 2 diabetes but that the benefits may not be sustained long term in African American women. MI may be useful in group education, but it has not been studied extensively in this setting. However, there are other ways that education can remain client centered in the classroom environment. Healthy Interactions, Inc created Diabetes Conversation Maps in collaboration with other health-related organizations to engage patients in the group learning process. The map aims to replace didactic instruction with a dynamic learning experience that fosters conversation between patients and healthcare providers. There are five different diabetes maps, with foci ranging from Diabetes and Healthy Eating to Caring for Gestational Diabetes to Continuing Your Journey. These maps combine a series of images and metaphors on a 3- X 5-ft tabletop display. Patients gather around the map as the facilitator leads them through an interactive discussion. The map is designed to involve all group members in a discussion about diabetes to build confidence and foster a sense of belonging. According to its Web site, Healthy Interactions is devoted to driving “Personal Health Engagement,” a term it developed for helping individuals commit to healthier actions, and aims to create “Aha! 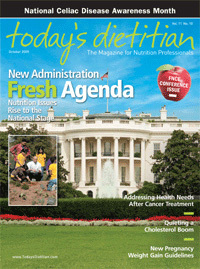 Moments” that inspire people to change personal health behaviors. Any licensed healthcare professional can become a trained conversation map facilitator. To locate a training workshop in your area, visit www.healthyinteractions.com. The training is also offered online for those without an upcoming workshop in their area. Recall the diabetes gripe list. Many of those frustrations are beyond our control. However, we are also able to assist patients with handling many of the grievances listed. For instance, through MI, we can help ease some of our clients’ diabetes-associated frustration and burnout. Additionally, by attending Conversation Map groups, patients may begin to feel that they are not alone in their struggles with diabetes. When patients and healthcare providers work as a team, they accomplish much more in the arena of behavior change and diabetes control. — Janice Holm, MPH, RD, CHES, is a dietitian, college nutrition instructor, and freelance writer based in southern California. Her areas of expertise include diabetes, weight management, wellness, and sports nutrition. 1. Becker MH. Patient adherence to prescribed therapies. Med Care. 1985;23(5):539-555. 2. Butler C, Rollnick S, Stott N. The practitioner, the patient and resistance to change: Recent ideas on compliance. CMAJ. 1996;154(9):1357-1362. 3. DiLillo V, Siegfried NJ, West DS. Incorporating motivational interviewing into behavioral obesity treatment. Cogn Behav Pract. 2003;10(2):120-130.